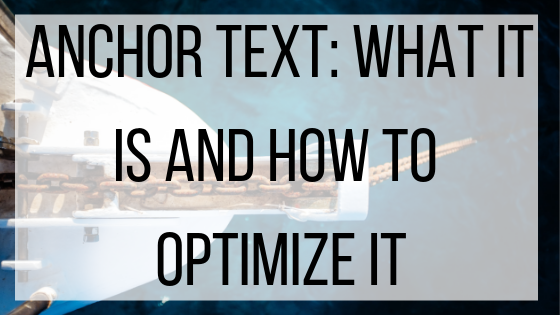 Anchor Text: What It Is And How To Optimize It | BMT Micro, Inc. While writing about a new topic in your field, how often do you think to link that new topic with an old one? Many marketers get so excited about the new ideas they are sharing that it does not cross their minds to relate it back to a hyperlink containing previously discussed subjects. This text, known as anchor text, is frequently overlooked. However, when used correctly, anchor text can help customers understand topics in more depth and boost your SEO. Optimizing anchor text might sound like a trivial task, but it yields big results. Anchor text is simply a clickable, hyperlinked text on a website that leads to other pages on or off of the same domain. It is used to help tell search engines what the page is about, and to help direct customers to a more in-depth answer in the case they do not fully understand a concept you mention. To get the most out of your anchor text, make sure it is truly relevant and specific to the topic. While you do not need keywords for your anchor text, you should include it in a sentence that contains your target keyword. When anchor text is linked to relevant and descriptive information, search engines (especially Google) are able to detect the keywords, and it will help rank both your current topic and the hyperlinked topic higher in searches. Keyword “stuffing” is using the exact same keywords repetitively, and this is something to watch out for with anchor texts. While you do want to mention your keyword so the search engines will pick it up, stuffing keywords will make them suspect that your main goal is to rank higher, rather than provide helpful content. Do not try to use links that do not look like links for the sake of keeping your page uniform or trying to hide the anchor text. By not allowing the anchor text to stand out, your readers will likely miss the links. All anchor text is not created equal. There are many ways you can go about creating anchor text, but here are four of the most popular and commonly used types. Partial match: The most common method of anchor text, partial match uses a variation of the keyword describing the linked page’s topic. This method works so well because it clearly informs the reader and search engine of the topic of the link, while allowing the content to flow naturally. Partial matching helps eliminate awkward phrasing for the sake of including a keyword in the anchor text. Exact match: Exact match is much like a partial match, except that it does include the exact keyword or key phrase in the anchor text. While exact matches are not a bad method, be cautious to not over use keywords. As previously discussed, using a certain keyword too frequently leads search engines to believe that you are not producing quality content. This means that your helpful article or updated web page might not be seen by your target audience, because Google will mark it as a quantity over quality page. Generic: Generic anchor text uses a common word or phrase to describe the link, such as “this blog post” or “this page”. Your audience will be able to follow this easily. Search engine bots will have to search a little bit harder for what you are referring to, so if you choose to use this method for an anchor text make sure you have keywords nearby in the sentence for optimal results. Anchor texts might seem small and unimportant, but to really stand out against your competitors they are critical. Using the hyperlinks and keywords together will allow search engines to understand what your page, blog or article is about and help you to reach an even wider audience.